Do you know a girl who needs confidence; the type of confidence that will lead her to make wise choices? You, my friend, can make a difference in her life! 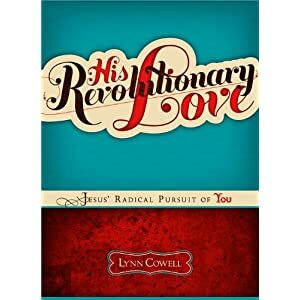 I’m going to give away a copy of my DVD message “His Revolutionary Love” plus a 30 minute conference call to one of you. How can you win? By helping me to spread the truth found in “His Revolutionary Love”. All you have to do is forward the email I send you to someone you know who invests in teens: a youth pastor, a sponsor at school, a small group leader at church, another mom in your circle of friends. This email will share with them the results that happen in a girl’s life when she discovers that Jesus is crazy about her, a 25% discount for purchases of more than four copies and the free small group guide. For every email you send to these influencers, it will equal one chance to win! I’ll choose the winner and announce it my post next Monday. Just email me at Lynn@LynnCowell.com and request the email. I’ll get it right out! Friends, I am receiving so many messages from teens and moms alike on the impact that “His Revolutionary Love” is making. Thank you so very much for helping me to make a difference in this generation and in building relationships with moms and daughters to last a lifetime! I sent you an e-mail. I am SO GRATEFUL for your blog! May God bless you. Thanks so much Shawnia and to each one of you who have emailed me! I am so thankful for your help!